We are very proud of our facility as we’ve created spaces that are filled with natural light, order and beauty as well as open spaces that encourage children to delve deeper and deeper into their interests. Babies are born wanting to learn, like little naturalists. They explore their world by experiencing their environment through all five senses even before they can crawl. We encourage this learning by providing new opportunities for them to touch, taste, smell, grab and listen to the world around them in a safe and nurturing environment. Throughout the day, you will see Infant and Wobbler teachers talk and sing with your child during feeding, diapering and playtime. This interaction helps your baby begin to understand language and conversation. Our staff pays close attention to all aspects of your child’s development. As infants get more mobile, they become ‘wobblers’ which is just what it sounds like – lots of little wobbly babies learning to crawl and walk. 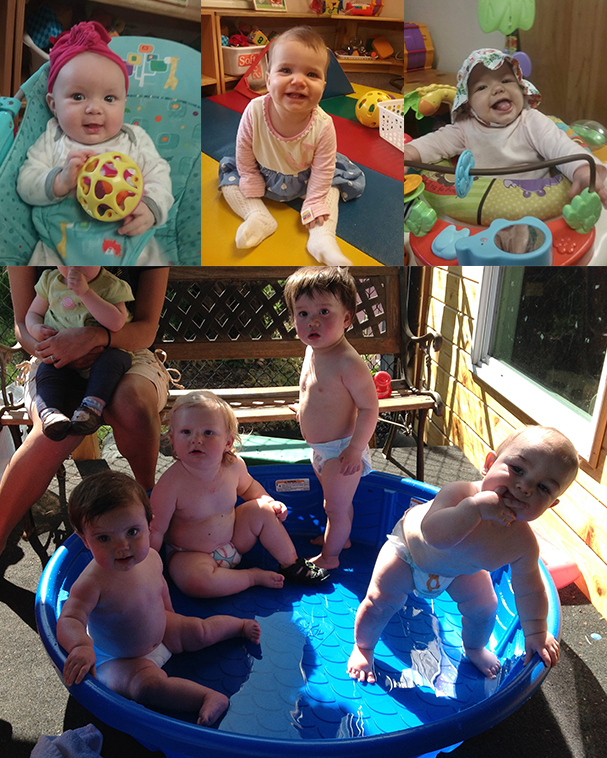 They continue developing those small and large gross motor skills while being immersed in a safe, creative environment. The goal is to support their budding need for independence, while offering them a safe environment as they master the physical development they need to be ready for the busy toddler room. Please visit our Enrollment page for further details on sibling discounts and fees.